YANGON, Myanmar -- Myanmar's government has denied a report by The Associated Press documenting at least five mass graves containing Rohingya Muslim civilians killed by the military with help from Buddhist neighbours. The Myanmar government's information committee said in a statement Friday that 17 government officials including Border Guard Police went to Gu Dar Pyin to investigate the AP report and were told by villagers and community leaders that "no such things happened." According to the government statement, a group of Rohingya "terrorists" skirmished with security forces in the village during "clearance operations" by the military. It said about 500 villagers who supported the "terrorists" attacked the security forces with weapons such as knives, sticks and wooden spears, and the security forces were forced to shoot in self-defence. It said 19 "terrorists" died and their bodies were "carefully buried" by the security forces. "The Myanmar government will not deny any human rights violations and will investigate if there is strong evidence. And if there are human rights violations after an investigation, prosecutors will take actions according to the law," the government statement said. In regard to Gu Dar Pyin village, "the preliminary result of the examination has proven that AP's report is wrong," it said. More than 680,000 Rohingya have fled Myanmar's northwestern Rakhine state to Bangladesh to escape a crackdown by Myanmar's military that began following attacks by a Rohingya militant group on Aug. 25. The United Nations and the United States have described the crackdown as "ethnic cleansing." The U.N. human rights chief has also suggested that it may be genocide. Community leaders from Gu Dar Pyin in the refugee camps in Bangladesh have compiled a list of 75 dead so far, and villagers estimate the toll could be as high as 400, based on testimony from relatives and the bodies they've seen in the graves dug by the soldiers and strewn about the area. Rohingya are a long-persecuted Muslim ethnic minority in predominantly Buddhist Myanmar. 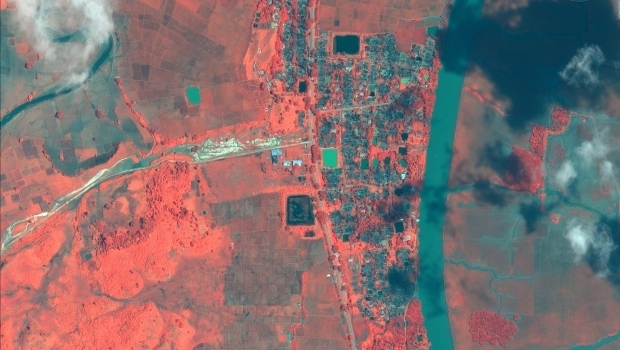 Myanmar's government regularly says massacres of Rohingya never happened, and has acknowledged only one mass grave containing 10 "terrorists" in the village of Inn Din.